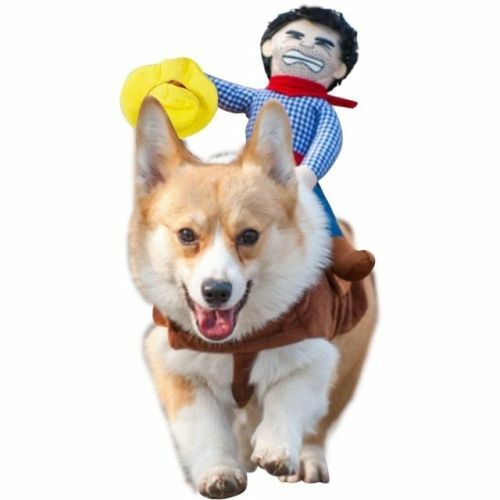 Hilarious Riden' Cowboy Doggy Costume for your Pug, Maltese, Jack Russell Terrier, French Bulldog, Boston Terrier Teddy, Corgi and more! Perfect for Weekend Parties, Halloween, Christmas, Birthdays, Weddings, Parades, Photo Shoot or Playdate. Made of soft, breathable, skin-friendly cotton and polyester fiber will keep your dog feeling comfortable all day long. The saddle shaped design and clothes is easy to wear for your dog. The velcro strap can be adjusted to ensure your dog is snug and cozy. The cowboy's hat and triangular binder can be put on and taken off. PLEASE NOTE: Order must be placed before October 19 to guarantee delivery before October 31st.